Gwyneth Paltrow has an infectious smile. When she walks into a room, it’s hard not to immediately start feeling wonderful. I had no idea what it would be like to hang out with Gwyneth Paltrow for twenty minutes, and never dreamed that would ever happen in my life. She starred in one of my favorite romantic films (Sliding Doors) and portrayed one of the most memorable guest characters on Glee, the free-spirited Holly Holliday. She also won Best Actress in 1999 for the role of Viola in Shakespeare in Love. Let’s just sum it up to say I’ve enjoyed every film of hers that I’ve seen! Most recently she has been winning over audiences everywhere as Penny Potts in the Iron Man films and The Avengers. 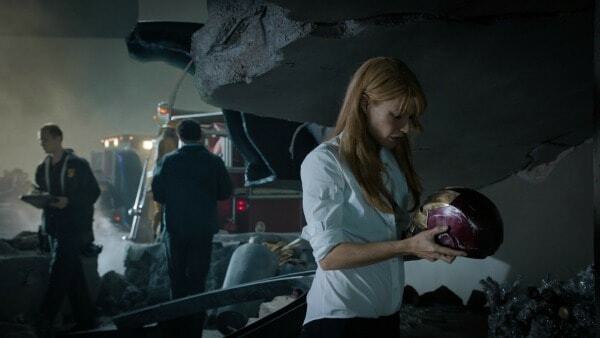 With Iron Man 3 opening in theaters on May 3rd, 2013, Ms. Paltrow has been speaking with various outlets about what happens with Pepper Potts in the new film. We couldn’t wait to ask Gwyneth herself about her experiences wearing the Iron Man suit. “I love putting on the suit…I’ve never done anything like that in my whole career…my son was on set, and so I’ll never forget it; I walk out onto the set, and I was fully dressed in the suit, and his face…I’ll never forget his face. Like, he was in shock and awe. It was so cool.” Gwyneth earned even more “Mommy Cool” points with her kids because there is now a LEGO version of Pepper Potts. “I am a goddess!” she joked. The Marvel films are Gwyneth’s first action films, and we wondered if she had considered starring in any other action films. “I don’t know. I would actually really like to, but really, am I old now to start?” she responded, laughing. In the comic books, Pepper Potts does get her own suit and becomes a character named Rescue. Can’t wait to see this movie! Thanks! Very cool! I cannot wait to see this!! So awesome! I cannot wait for this movie!! Only two more days!! Did you get your tickets already? wow that is so awesome, such an amazing opportunity!!!! I can’t wait to see this movie, great actors and awesome action! How awesome! I can’t wait to see this! Pingback: Fun on the Set Interview with Gwyneth Paltrow/Pepper Potts #IronMan3Event - What U Talking Bout Willis? I still can’t believe that I met Gwyneth Paltrow, and that she actually signed a copy of her cookbook for me!